Pinypon : Pinypon or Pin Y Pon are the new latest doll craze being released in the UK under big toy producer/retailer Tomy. 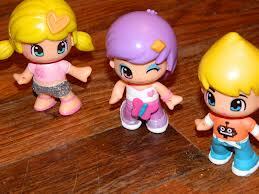 These are set to be hugely popular as the dolls are all customisable. Their bodies, accessories and hair can all be swapped therefore creating a unique look every time. Also, each of the dolls have two facial expressions on either side of their heads allowing even more different looks. Some of the dolls are also flower scented. Pinypon is set to be very sought after as children will want to collect them all due to the amount of accessories available increasing the amount of combinations that can be made. There is already numerous Pin Y Pon dolls available either in singular packs or some come with pets in a handy carry pack. There is gift set travel packs as the Pin Y Pon dolls love to travel, currently there are sets for New York and Paris, both containing unique accessories associated with that Country. For example the Paris pack contains a French Poodle and a mini Eiffel Tower. The New York pack contains a New York Yankees cap and a State of Liberty crown. As the product range expands, it is assumed more countries will be added. As the Pinypon dolls love to travel, there are also cars available to buy, each of which come with a doll and a picnic including plate, cutlery, flask and food. The other vehicle available is a caravan, the pack also includes a doll, a pet and even has a surfboard, a boat with a slide, deck chairs for relaxing and even a little pool with a shower that squirts out water. The pack also includes multiple accessories for decorating the pinypon doll and caravan including a sheet of stickers. (Read More) . ♥ I was sent some really exciting goodies from ( Mommy Parties ) to host a party and review. Even tho I'm a little late posting, I'm sure you will be excited to learn about a brand of toy's you're children will love, and you will appreciate another new website to host your very own parties. You will instantly become one of the most popular mom's on the block and in you're mommy group. 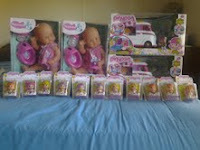 I was sent 2 baby doll's , one for me, one for a lucky little girl, I also received 2 Pinypon mini van's , and 11 pinypon miniature dolls. I remember as a child, seeing doll's like this at the stores, I always wanted one so bad, I begged, pleaded, and even asked for one for my Birthday and Christmas. I was never able to have one of my own. When my niece was born, I was finally able to buy her one to play with when she was older, and for me I was able to live through her when playing with her while she played with this doll. Now that I'm much older, I was excited to see not just one of these dolls in my Mommy parties kit, but 2! I knew that my family was going to be excited for this kit, but one lucky little girl was going to be playing with my childhood doll that I always wanted, and it warmed my heart. The dolls come with a pink pacifier, a cute little pink outfit, and a potty. This doll drinks, and yes.. actually goes to the potty. It's a great way for children to learn how to take care of things, and while pretending to be a real mommy. Here are a couple of the little Pinypon people. I loved everything about these little guys. I love the unique looks, and the accessories that the little figures come with. Each one has a different personality and features. I love that about these little people. It's a great way to show children that It's okay to be different. There are blonde's, and even little girls with purple I received a set of each different Pinypon people, and they even have little mermaid girls with pink hair! I loved those. I love mermaids, but I also love pink. One of the features that I love about the Pinypon people is the ability of mixing and matching. Remove the hair, face, and accessories. 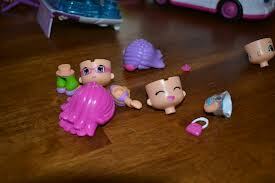 You can have one shirt on a doll, and remove it to another, to have a whole new doll. I love the endless possibilities of having a complete new doll within seconds. I love the cute accessories that come with the dolls such as the hair and the purses. Remember these are made for (ages 4 and up). 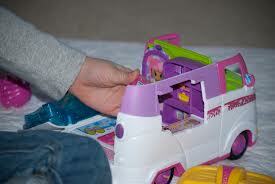 Speaking of accessories, what doll wouldn't want to cruise around in their very own Mini Van?.. I know I would! I thought the little van that is for the Pinypon family was one of the cutest accessory for toys I have seen in a long time! It folds out as a mini play set for the Pinypon dolls, to pretend to sleep, eat, dance, and whatever else a child's imagination can come up with. I loved the chic' look of it, it's perfect for a girly girl, or even a tomboy/girly girl. It's not over done with all the major fru-fru colors, perfect for any child that loves to play. And it's the perfect size for little hands. These toys are perfect for any special event, such as Birthdays, Christmas, or even a special gift for grandchildren on an occasional visit. It will keep children occupied for hours. They are perfect for children, and even grownup will want to sit down and play. Hours of fun, and fun imagination time. If you go to Pinypon's website, you can find more information, such as where to buy, ages, ect. Pinypon has one of the cutest websites EVER. Your child will enjoy browsing the website with you.